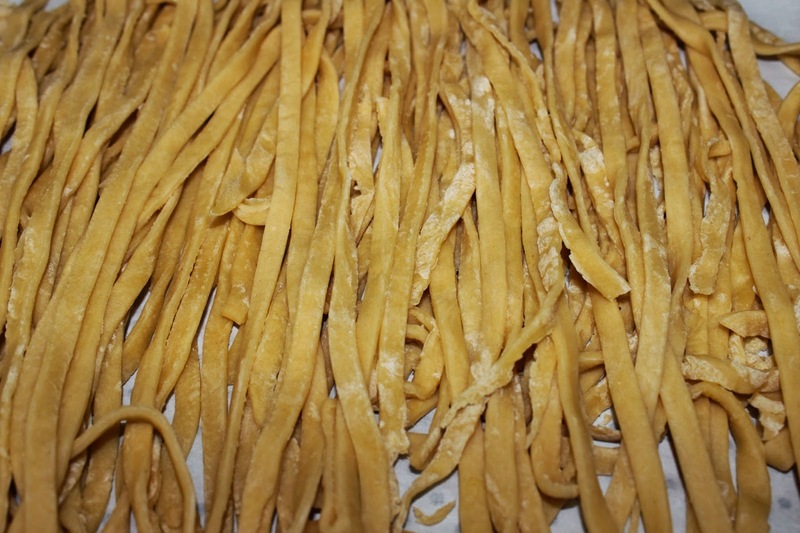 Today’s project was Homemade Pasta. 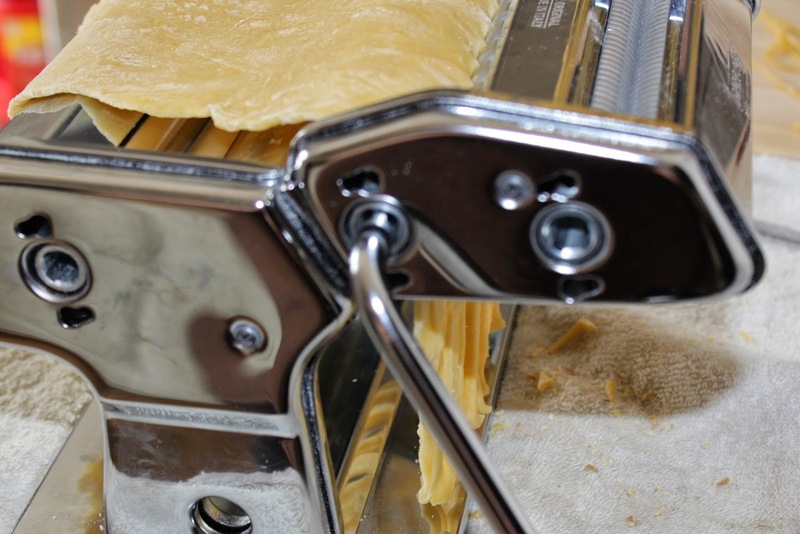 My brother gave us a Marcato Atlas Pasta Machine for the holidays two years ago, and while my husband has used it from time to time, I’ve never bothered to learn how to make a pasta dough make use of the machine myself. That changed today! Mound 2 3/4 cups your flour, leaving a hole in the center. Crack your eggs into there (I cracked four eggs to start with), then add the 1tsp salt. After this point my hands got too messy to take pictures, but next you use a fork, break the yolks and slowly add some flour into the mix while keeping the mound solid so you don’t have runaway egg. 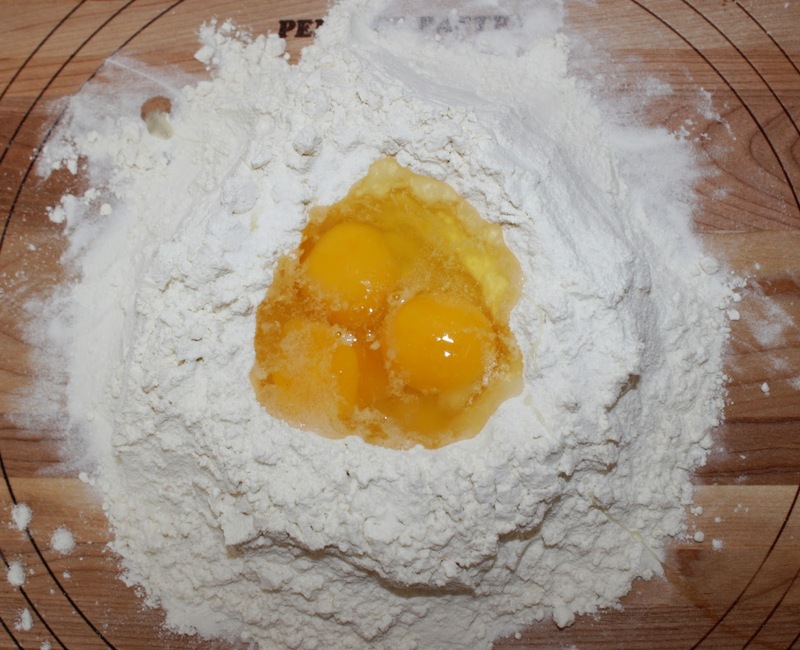 Once the egg mix is no longer runny, incorporate more of the flour until it’s all mixed well. At this point, because I had large instead of extra large eggs like the recipe calls for, I ended up adding a fifth egg, breaking it over top of the dough, piercing the yolk and spreading it before mixing it in. That got the dough closer but not quite there, so I used a sixth egg, then about 1/8 cup of the flour I had set aside. If your dough feels right after four or five eggs then stop at that point! Next up is kneading the dough four 3-5 minutes. 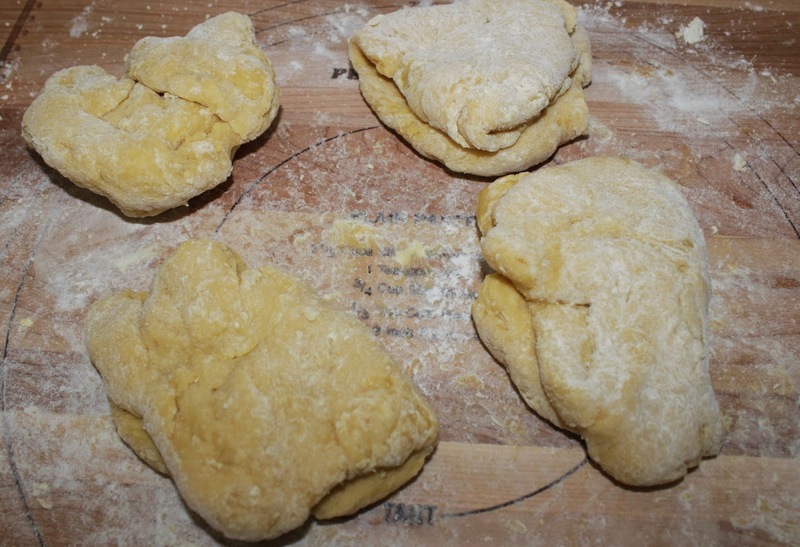 I separated mine into four chunks, turning it as I kneaded and stretched it with the heel of my hand, folding it over, and repeating this several times. Then wrap the dough with plastic wrap and let it rest for 20 minutes. 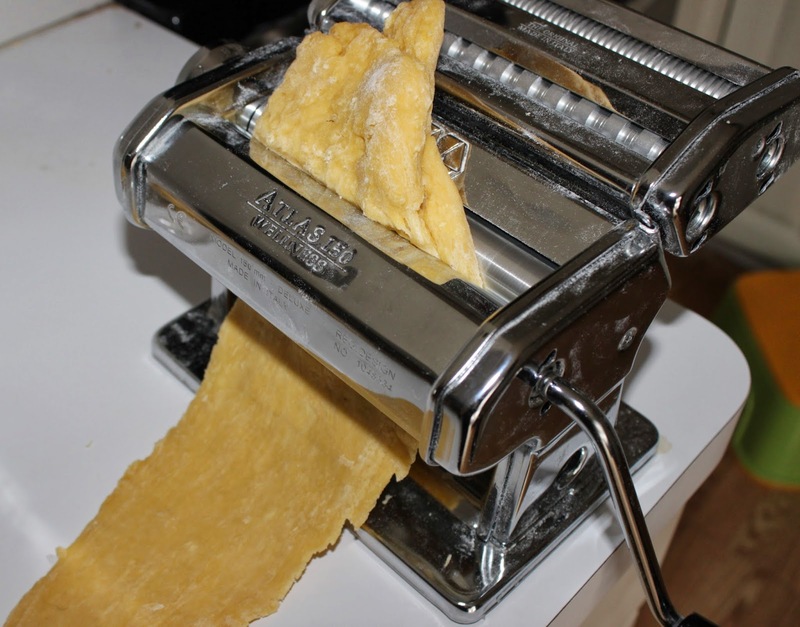 After this my younger two children decided they wanted to work the pasta machine crank while I held it and fed the dough. This went surprisingly well, though the flattening press they did have some trouble mustering the strength for. The machine also had an attachment so we used that to make a couple types of noodles. 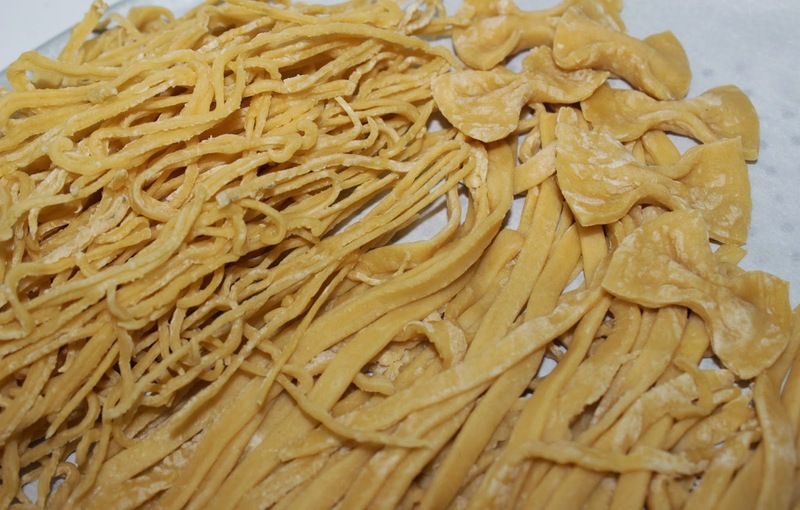 My youngest son and I also tried our hand at making a few bowtie pasta pieces. I’m not quite sure what to think of those. 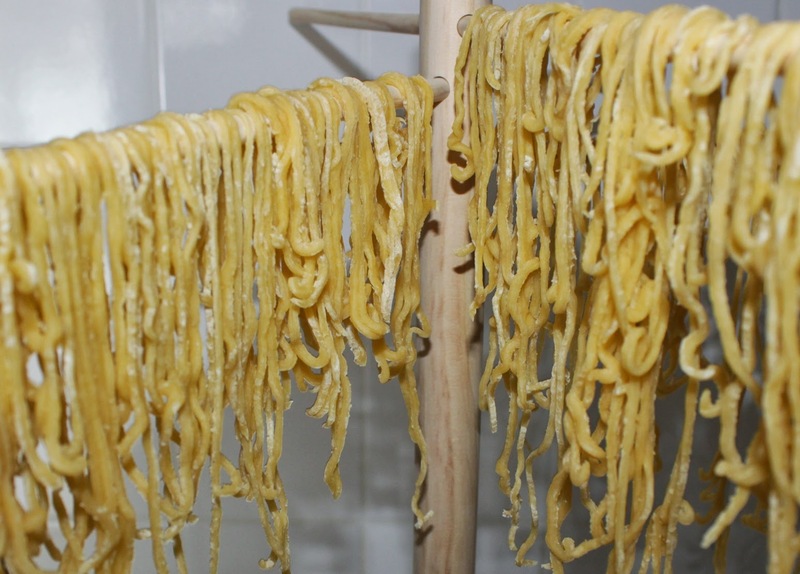 The pasta is currently sitting out to dry before I store it away. I’m sure it will come in handy soon! Tomorrow’s project is a Felt Bow!